Roskill Community Voice: Bury the Pylons - First 1000 signatures handed over! Bury the Pylons - First 1000 signatures handed over! David Holm has written a short update on the Bury The Pylons campaign, reporting on the handover of the first 1000 signatures on the petition on Sautrday 21st Sept. 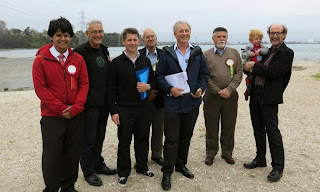 The first 1000 signatures on the Bury the Pylons petition were presented last week to Phil Goff , M.P. for Mt. Roskill, at Taylors Bay near some of the most unsightly pylons in the Manukau Harbour. Phil told a group of local supporters about how his father, now aged over 90 had swum in the area when young. 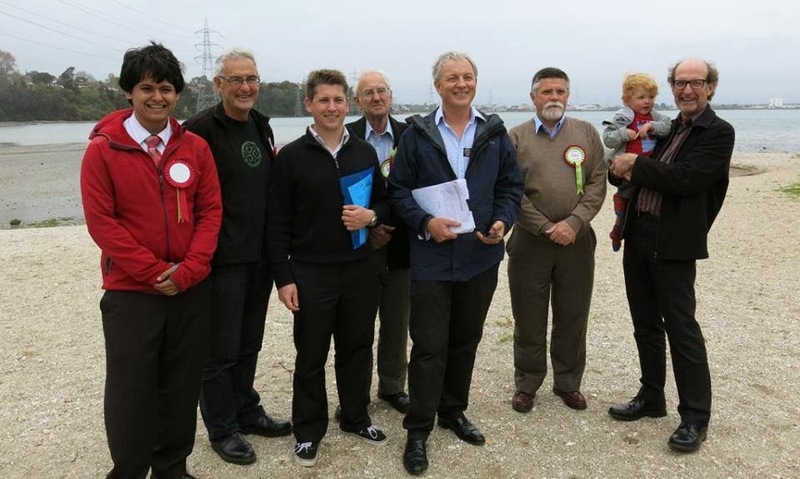 He pointed out that the $20 million plus improvements to the Onehunga foreshore would be hugely enhanced if the adjacent pylons were removed. All new Transpower lines in urban areas in New Zealand are now undergrounded. At the latest count, petition signatures are well past halfway to the second thousand. The offer for places to display "Bury the Pylons" signs is well in excess of the number of signs available. At a public meeting in Onehunga, Transpower representatives stated that they are receptive to opportunities to underground lines, provided funds are available from government or other sources. The petition points to the dividends being paid by Transpower to the Government which this year reached $295 million.